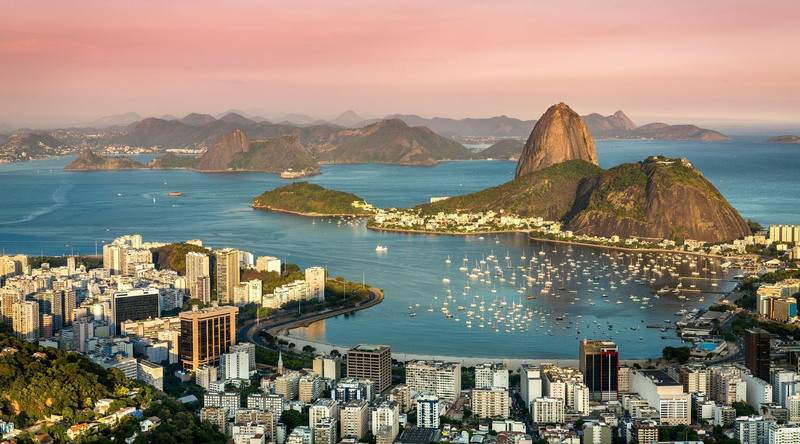 From the summits of Sugarloaf and Corcovado, take in breathtaking views of a magnificent bay set against a mountain backdrop. Check out the activity at one or two of the 23 beaches, crowded with sunbathers and swimmers, and also populated by surfers, bikers, and the girl from Ipanema. Pull up a chair at a churrascaria, and dine on the delicious grilled meat of your choice, washed down with a caipirinha, the national cocktail. No journey to Rio would be complete without a visit to one of the New Seven Wonders of the World—Christ the Redeemer (Cristo Redentor). At the top of Corcovado Mountain, towering high above the city below, this 125-foot-tall statue of Jesus Christ spreads its arms over Rio and offers breathtaking panoramic views of Guanabara Bay. Lose yourself in the world’s largest urban rainforest. Tijuca National Park is home to lush natural splendor, sparkling waterfalls, and thousands of plant and animal species that present a feast for the eyes and ears. Explore well-marked hiking trails in the Forest area, make the ascent to Christ the Redeemer in the Carioca Hill area, or visit Mayrink Chapel—the pink chapel in the woods—built in 1860. Also known as Sugarloaf Mountain, Pão de Açúcar rises high above Rio in the mouth of the Guanabara Bay. A cable car will take you to the summit of Pão de Açúcar, where you’ll be treated to an unparalleled view of Cidade Maravilhosa—The Marvellous City. Winding along the coast, Copacabana beach is perhaps the most well-known stretch of sand in the world. Teeming with Cariocas (Rio locals) and tourists alike, Copacabana is the place to go to see and be seen, and to immerse yourself the vibrancy of local life. Revel in the vibrant spirit of Carnaval from the grandstands at the Sambadrome, enjoying a bird's eye view of the colorful floats, costumes, and choreographed dancers. Visit the vibrant Rio Scenarium, where you'll dance to Brazilian popular music, sample Brazil's national drink, the caipirinha, and meet the locals. Journey to Villa Riso, a beautiful colonial mansion, and learn some Samba dance moves.